Laserscans and photography generate point-clouds (see picture below, and compare with section “Point-clouds and Ortho-photography: examples“). 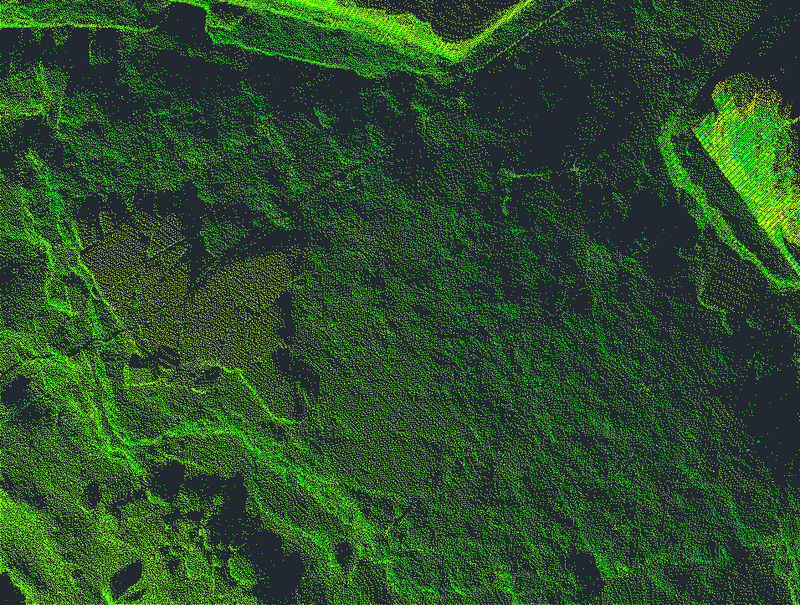 After connecting the singular points (‘meshing’) of the point-clouds, pictures can be created from laserscans, which give a similar impression to normal photographies (see second picture below), but the viewer can move inside a 3-dimensional model-space. 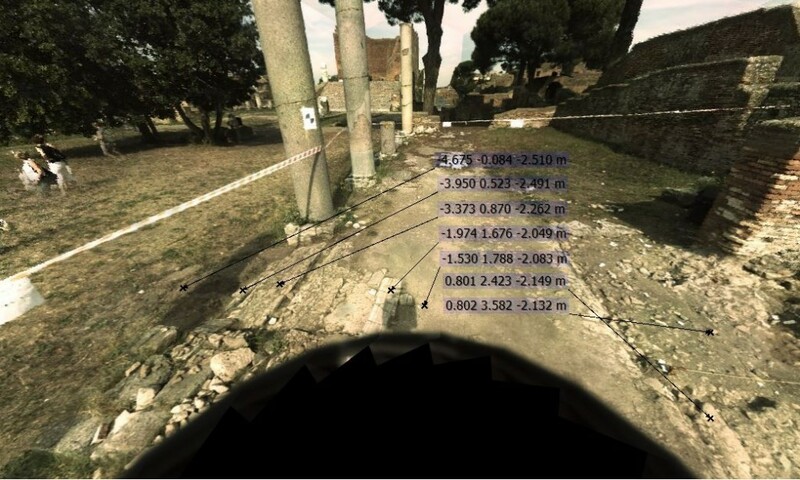 Measurements are taken relatively from the standpoint of the laserscanner. 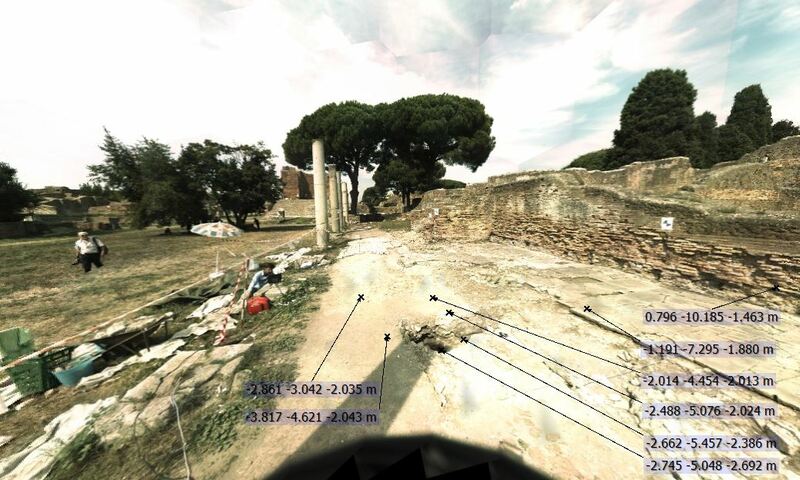 When the point-cloud is geo-referenciated the measurements would resemble to world-coordinates. For our example (see picture below), it is sufficient to use relative measurements to answer important questions regarding the shape and size of the portico MFP, its building-processes and -phases. 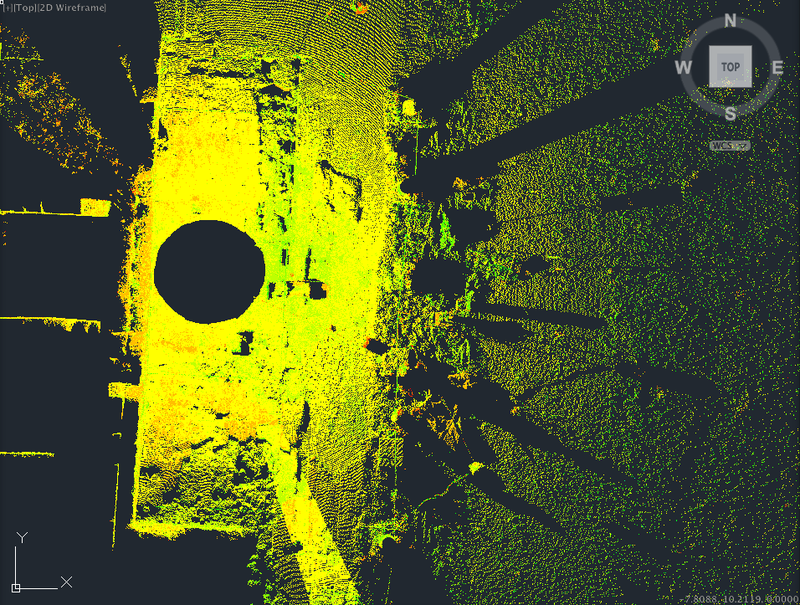 Slabs, which were laid directly on top of a solid wall of a predecessor-building, show the original height of the last visible pavement (see picture above: blue-transparent circle), 2.30 m above see-level (which corresponds to the relative measurement of – 1.799 m underneath the position of the laserscanner). In all areas around the predecessor-wall, the pavement had been sunken irregularly. Due to geo-physics, we know that this process happened because of cavities in the underground and the irregular density of filling-material underneath the slabs (see picture below: the irregular black areas are cavities). By comparing the heights (the last number in the coordinates, highlighted in transparent-blue in the pictures), we are able to distinguish, which parts of the pavement were laid at the same time or in the same building-process, even if they were seperated by areas of later robbing-activities, collapse-catastrophes a.s.o., which are characterised by an irregular rubble-surface that is visible in the picture below. A few slabs in the foreground in the picture above, were built on top of a very solid and regular fill. This fill can be defined as one single building-process. Our question was, if these slabs had the same height as the slabs closer to the backwall, which were laid on top of a very irregular fill containing broken wall-fragments from an earlier portico-phase (see picture below). If this could be verified, both areas would have been part of the same building-phase. 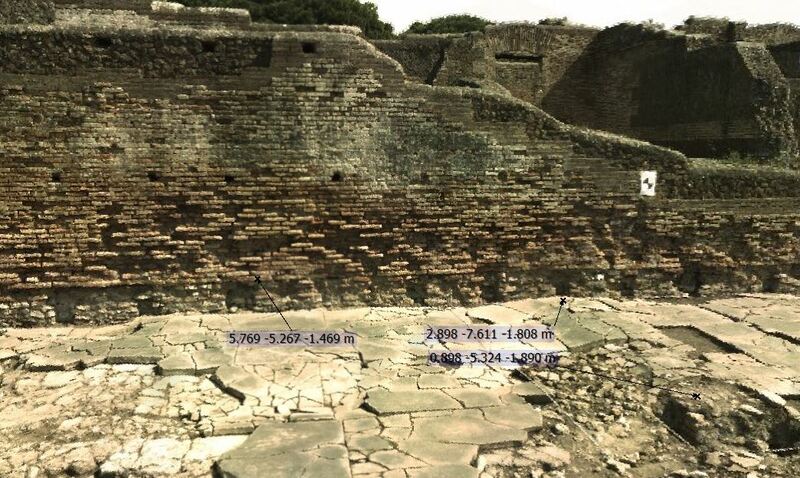 The fundament of a statue-base that has the relative height of -1.852 m, which is 2.25 m above see-level, can be verified as part of the last visible pavement on the picture above. By comparing it with the other pavement-slabs (see picture above), which all were more or less within the same original height, we find nowadays a certain tolerance of roughly 5 cm, due to the several collapse-catastrophes and obviously the consequences of at least one major earthquake. 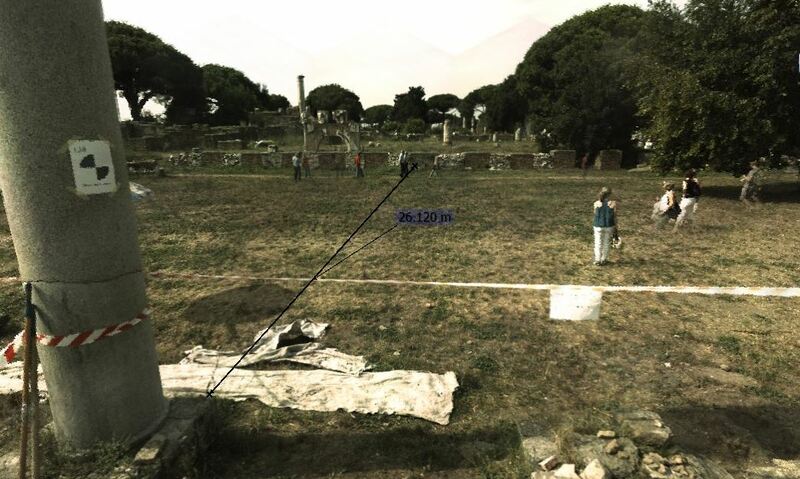 It is very practical to take any kind of measurement in the 3-D-model-space as it would be possible on site (see picture below: the distance between the portico MFP and the Basilica MFB). The old plans of the excavations are very schematic. These plans are based on the assumption of 90 degrees angles in almost all corners of buildings. In reality, orientations differ and 90 degrees angles are very rare. Therefore, if you would use these plans for measuring, there would be errors of more than 40 cm already in the Forum-area. For the interpretation of specific Forum-concepts, (concept means different buildings belonging to the same architectural plan), it is fundamental to have the exact measurements. The Roman architects and builders worked normally very exact, so it is possible for us to define, which buildings with the same orientation could come from the same building-phase or which relations between different buildings were intentionally planned by the Roman architects. When the Roman architects had built the old republican temples in the north part of the Forum, they used the same orientation as the Cardo. 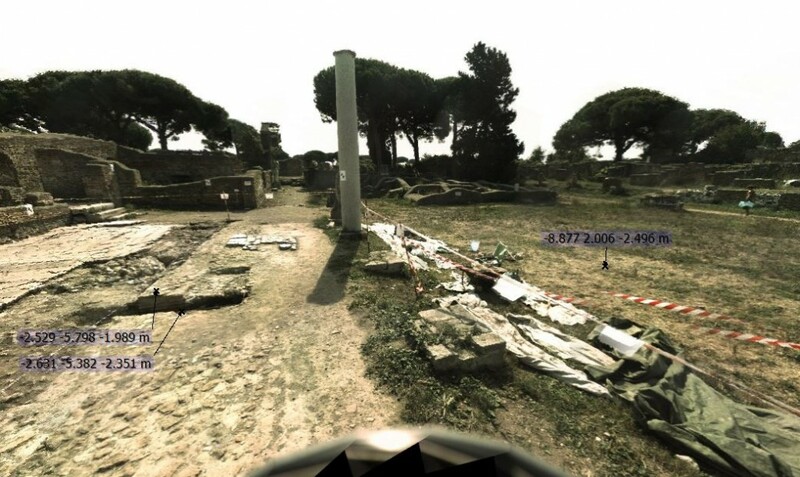 When, roughly 100 years later, the Augustan architects built the Roma and Augustus temple (TRA), the old temples were still visible, but a new orientation was selected intentionally, which differed a few degrees. The same is valid for all following Forum-concepts of the first until the fifth centuries. Detailed studies of this phenomenon are in progress, and will be presented in the forthcoming interim report in Römische Mitteilungen. In the attempt to distinguish different layers and building-phases horizontally, the laserscans are useful to draw sections. 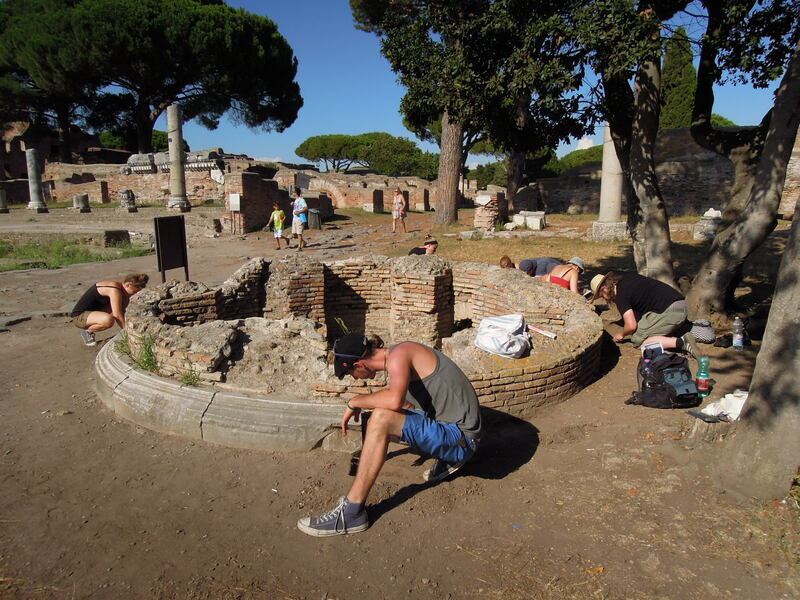 In Ostia, raises of the street-levels are a typical phenomenon to prevent severe damage by the regular Tiber-floodings caused by melting snow in the Spring-time. 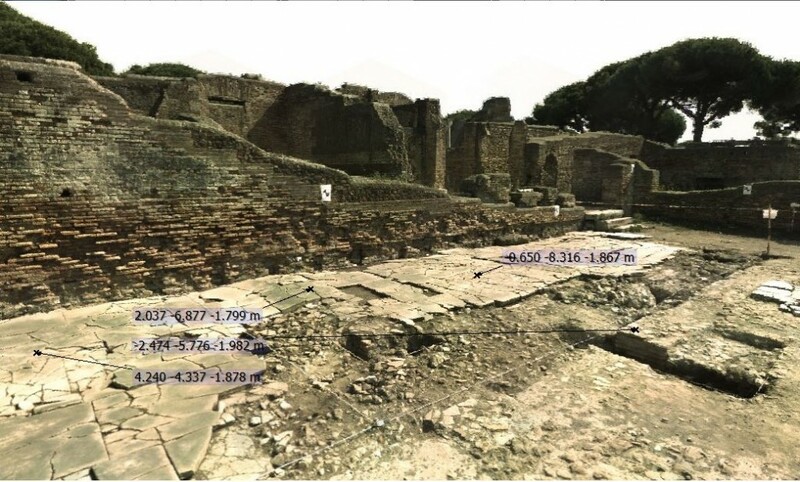 These level-raises can be sorted chronologically and therefore, in Ostia we have the chance to date buildings by the absolute height of the fundament. In the picture below, the two red lines highlight the different levels of the pavement of MFP and the level of the Forum. 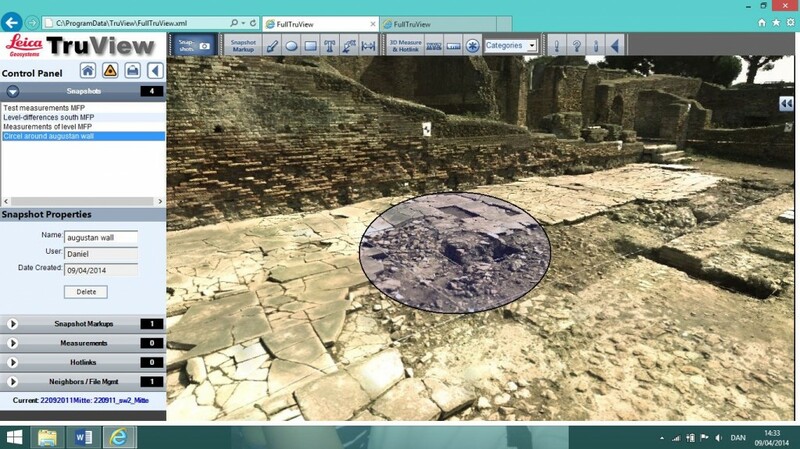 In one trench, we could document the horizontal and vertical development of the portico through time (see section “Trenches in 3-D“, also visible on the picture below). Because obvious traces of stairs are missing in the last phase, initially we had the working-hypothesis that the latest Forum-level was (almost) at the same height as MFP. During the excavations of the 1930’ies, the latest levels of the Forum’s plaza were almost completely lost. 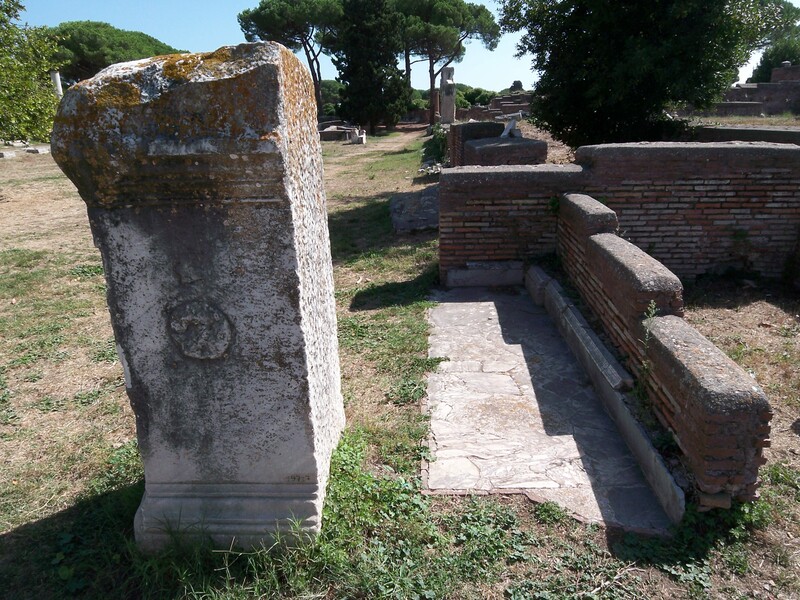 However, a surface-cleaning in 2013 around the central round monument of the Forum (MUN), and the measuring of the few preserved slabs next to the inscription of Attius Clementinus (ACL, see pictures below) along with the stairs of the later removed portico in front of the Forum’s Basilica (MFB), brought the last evidence of these lost Forum-levels to light. 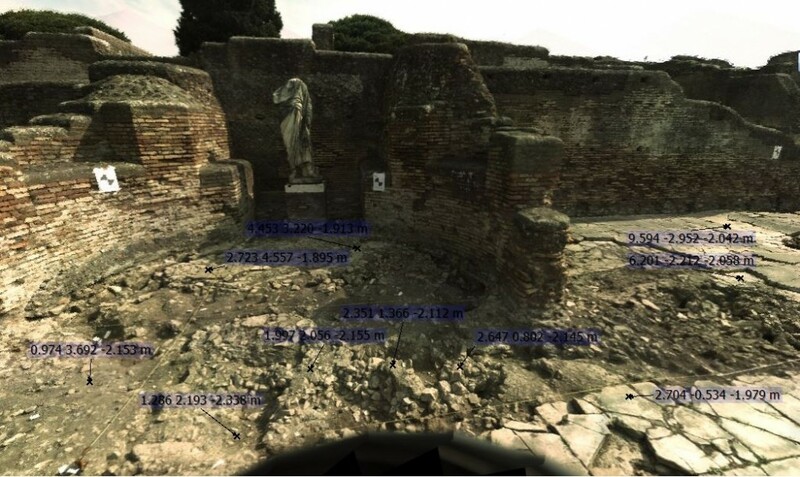 By using laserscans, we can define and vizualise all these relations between the Forum’s plaza and the surrounding buildings in an easily comprehensive manner. 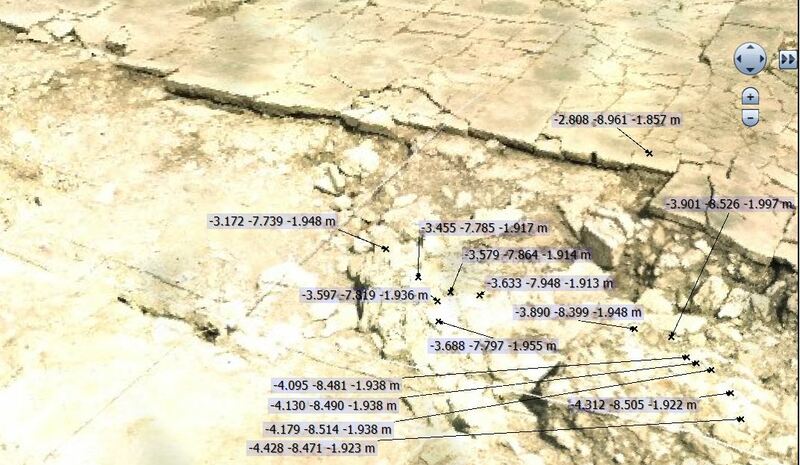 Coordinates from the laserscans enable us to measure the different layers, fillings and architectural structures inside the trench, and compare these with levels on the portico and on the Forum’s plaza (see pictures below). 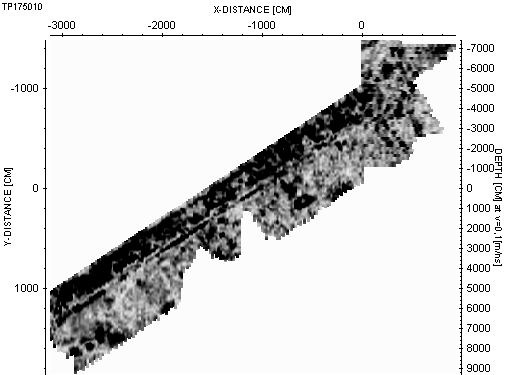 Of course, levels can be taken in the traditional way by hand too, but the advantage of the laserscans is the complete free choice of measuring-points in the 3-D-space – even in the post-excavation-work. 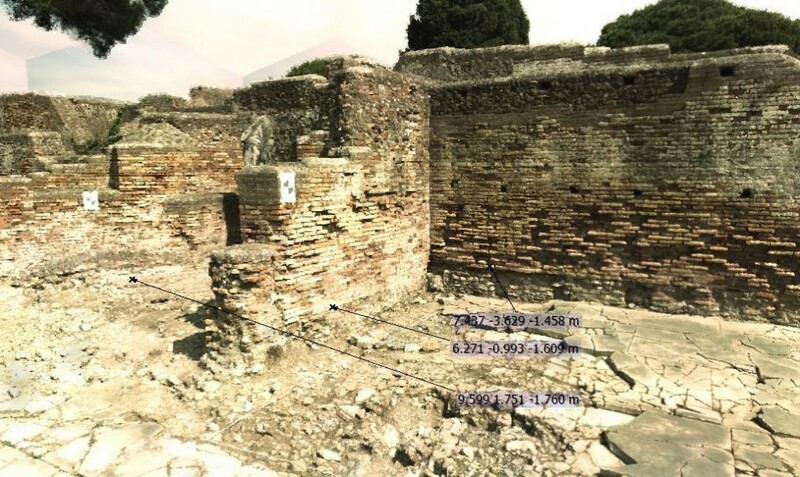 In the picture below, we can measure the difference of 15 cm between the fundament of the backwall and the fundament of the apse. This could demonstrate the different time of construction of both structures. Until recently, it was believed that the whole portico MFP was built in one singular phase in Hadrianic times, but the exact measuring of the fundament-levels shows a much more detailed building-history, starting with the apse as an independent architectural structure of a previous unknown Forum-concept of the first century AD to the latest additions in the fifth century (see pictures below). The latest level inside the apse is again 15 cm lower than the fundament of the apse, but still 15 cm higher than level of pavement outside. It is not random that measurements of 15 cm occure in many contexts, because the Roman measuring-units were palmus and feet, whereas one Roman palmus equals 7,4 cm and one Roman foot equals ca. 30 cm, thus 15 cm equals two Roman palmi or one half Roman foot (these standard units are also visible in architectural planning – for example on the marble roof tiles or all other decorative architectural elements).